If my right hand is my meter, then my left hand is definitely my signal tracer. I had a nice Micranta from Radio Shack. I had it for 40 years. It finally went belly up. Amazingly one exactly like it showed up on eBay. However somebody else wanted it worse than me. I bailed at $75. That’s when I ran across this little Velleman project kit. It is supposedly a signal tracer and signal injector. It looks like a toy, but I’m betting that with a few innovations and upgrades I can turn it into a professional piece of test equipment. The important part is not the guts, but the peripherals. Plus it’s a kit, what’s not to love? 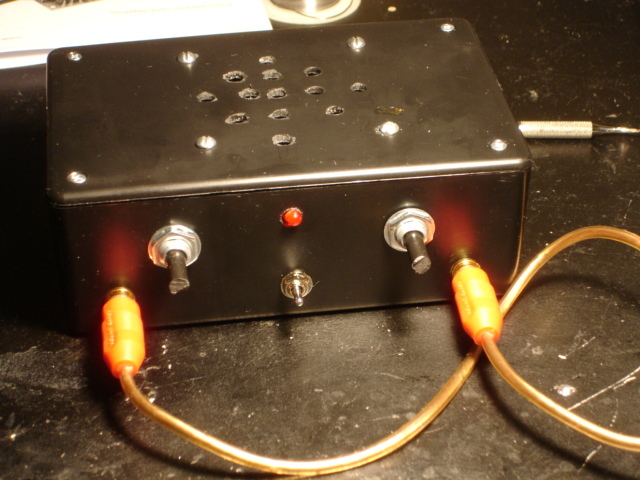 It uses a LM386 opamp for the tracer with a 40 db gain. Hopefully that will be enough. I spent about $15 at Radio Shack today for a couple of RCA jacks, a small switch and a plastic project box. I have everything else. One thing I am going to do is glue a piece of metal to the bottom and use it as a ground to hopefully avoid hum. I want to make a separate cable for RF. I plan to put a .02 disk cap and a diode in series with the tip. I thought about jacks and considered screw on or BNC. I chose RCA for their practicability. I’m going to document every stage of the construction. This can also be a group project. I’m open to any and all suggestions. Wish me luck. All afternoon I've been thinking how great it would be to find an old RF probe. There is a Heathkit on eBay. How weird is that? Too bad they want too much for it. You know you're old when you can't read the colors on those tiny resistors, even with a magnifying glass. I have had a really fun day. I've made probes and everything. Of course I'm probably grasping at straws. I just made the last connection and I have yet to turn it on. Can you feel the excitement? I'm taking a long break, then I'm going to double check everything and...? It does work but the output is distorted. Probably a bad LM386 chip. I'd test it but I need a signal tracer. Ha, ha. I'll put it aside for now. Geez, I love to assemble stuff. So, I ordered a new LM386 IC. Actually, I ordered 10. That's the smallest order I could get, so if anybody would like one let me know. They are great little amplifiers with an output of 0.5 watts. If it is still distorted then I switched a resistor somewhere, which I doubt. I've built a couple of those Velleman kits and they've always been fun to do. Let us know how you make out with getting it working! I just tried to get it tracing RF but it ain't working. My favorite kit was a Ramsey FM 25 transmitter. I wish I could get a job building kits. So- this should come as no surprise: I bought two more Vellerman kits. One is a 5 watt amp and the other is a high gain microphone preamp. I should be able to cobble something together. I had no idea how much my life depended on a good signal tracer. I see the same thing in my job as a (self employed) power equipment mechanic. We get used to doing something a certain way after so many years (or maybe decades) and when that particular method is not available we feel lost!! .... at least I do. Yep! Me too. The part I miss most is the RF jack. Maybe this next project will work out better than the last, which actually worked, but was distorted. 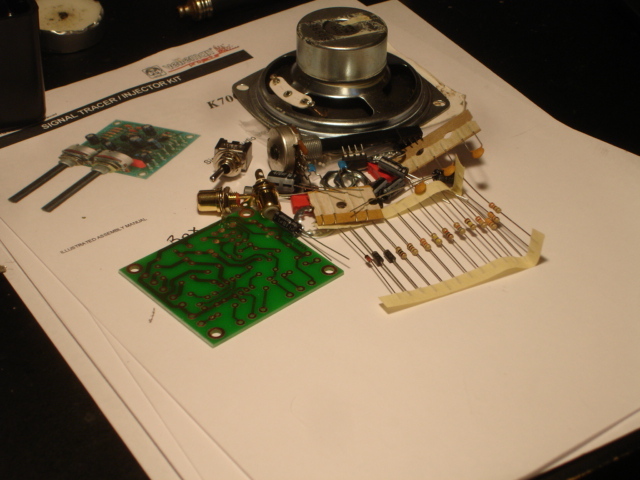 I need to go from a phono cartridge to the plate of an output tube. I already have some good ideas. Life always entertains me. Sometimes it sneaks up behind me and hits me in the head with a hammer of silly putty, just so I remember who is in charge. 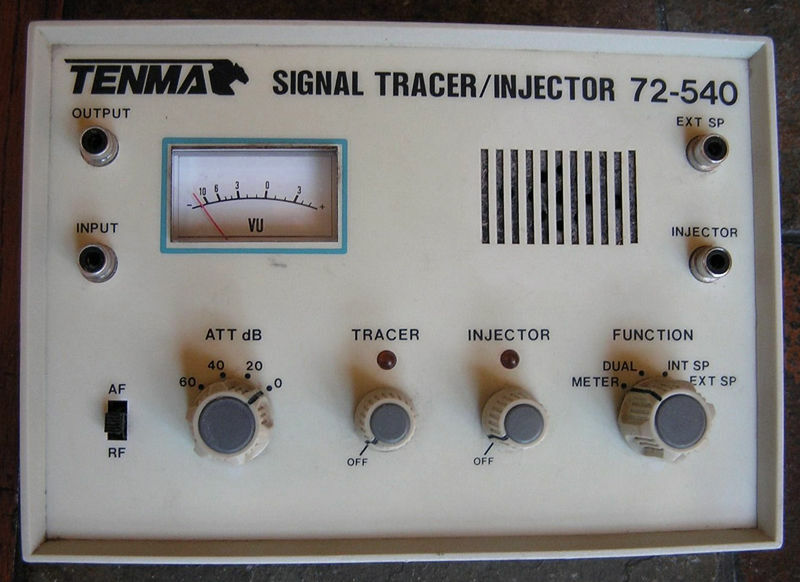 I just bought, on eBay, for $45, a Tenma 72-540 signal tracer. This unit actually puts my old Micranta to shame. Sometimes I just have to laugh. Sometimes hysterically. I got the Vellerman microphone preamp kit today. Like a good meal I'm putting off building it. Wow! 20 discrete components on a board 1" x 1 1/2". Through the mag lamp the tip of my iron looked huge. It reminded me of the old iron that my grandfather used. He heated it on the stove. Wow! 20 discrete components on a board 1" x 1 1/2". Through the mag lamp the tip of my iron looked huge. I was told to twist a piece of wire around the end of the iron. I've never tried it. So- I have looked at several RF probes on-line. They all have the same problem. They can only be used on a circuit of 50v. Of course I need to be able to block 400-600v. Any suggestions? BTW- why am I the only one posting stuff? You all still recuperating from the holidays? Ouch! Time for some hot cocoa. The signal tracer came today.